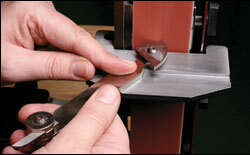 This fixture will hold almost any Robert Sorby tool tip for sharpening. One end has hardware for small HSS cutters with rounded bottom and the other holds scraper cutters that have a hole or a notch. This fixture will keep hands safe and out of the way of the grinding wheel when used with a tool rest on the grinder. Grinder and cutters not included.